Allyson's fine art photography is filled with color and energy. Expressing herself through her art has provided Allyson with the opportunity to combine her passions for the arts, design and travel. I enjoy working with Allyson, she and her work, exude her love for what she's doing! I work with artists that I feel will connect with my clients and the artwork is suitable for their homes. I have been working with Allyson for the last year, and it's a pleasure for me to see how clients respond to her photography, they love the colors, movement and subject. Allyson has a background in interior design as well, so she brings this sensibility to her compositions. It's always interesting for me to see what a photographer sees and can capture. Allyson has a wonderful way with color, and a thought provoking way with names, I always want to learn more about them. It's always interesting for me to see what a photographer sees and can capture. Allyson has a wonderful way with color, and a thought provoking way with names, I always want to learn more about them. In Allyson's PURE series, she explores the beauty of nature and captures the colors and details. I have known Kim Romero and her work for a few years. Kim’s work appeals to many, it's light and colorful and warm and easy. There is a familiarity and a comfort to her work, maybe thats due to the many layers and the warm textures that Kim thoughtfully adds to each piece. I just placed this painting and love how it will look in a clean crisp white kitchen, it adds depth, warmth and beautiful subtle color. 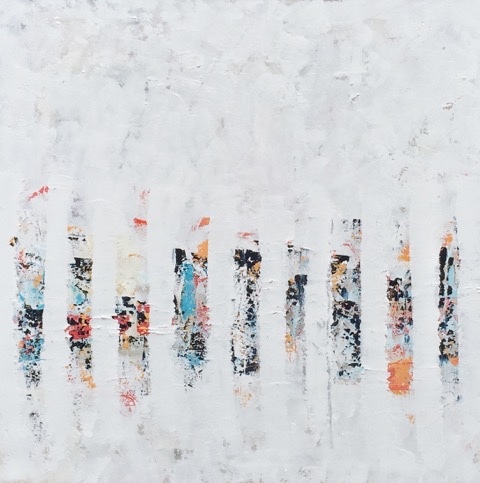 Kim's experience in interiors, food presentation, and garden design has resulted in a natural relationship between colors and texture, her work evokes both a "feeling of intrigue and calm". Kim is introducing a few new paintings this spring to her collections of Hydrangeas and Beach Towels, two different series that she is recognized for. The floral collection appeals to many with a love of nature, flowers, soft color, and again, the tactile quality. Bouquets de Fleurs Series 3, 36"x36"
Kim started her Beach Towel collection a few years ago. These paintings have great color and movement and capture both the ease and energy of summer. Two new ones that will be at Nest. A few of Kim's paintings at Nest. I love the inspiration for the Garden Party Triptych. Kim said, “Imagine peering through a white fence and you’ll get my inspiration, lots of glossy white layers that unfold to show a hint of the colors in the garden behind the fence." Garden Party 2, 36"x36" ea. Garden Party 1, 36"x36" ea. Garden Party 3, 36"x36" ea. Kim completes her summer collection with inspiration from the water and the coastline where she spends alot of time. Both Allyson and Kim's artworks are perfect for the lighter mood of spring into summer, they are warm, and welcoming with color and energy. I hope you can stop in to Nest to meet them both and say hi on Thursday May 11th, or another time to see their work, or please contact me for me info. Hope you have a happy May, Mothers Day and Spring! !